Imagine a chocolate cake under 5 minutes - sounds sinful and dangerous! But its okay in indulge in something sweet once in a while. Here's a quick and easy chocolate mug cake recipe that can satiate your instant cravings for chocolate. And if you have some surprise guests at home, impress them with this instant cake topped with some chocolate or caramel sauce or a scoop of ice cream. Making a instant chocolate mug cake has been in my 'to-do' list for long time. For one reason or the other, it didn't happen until last week when I had a sudden craving for something chocolate-y. 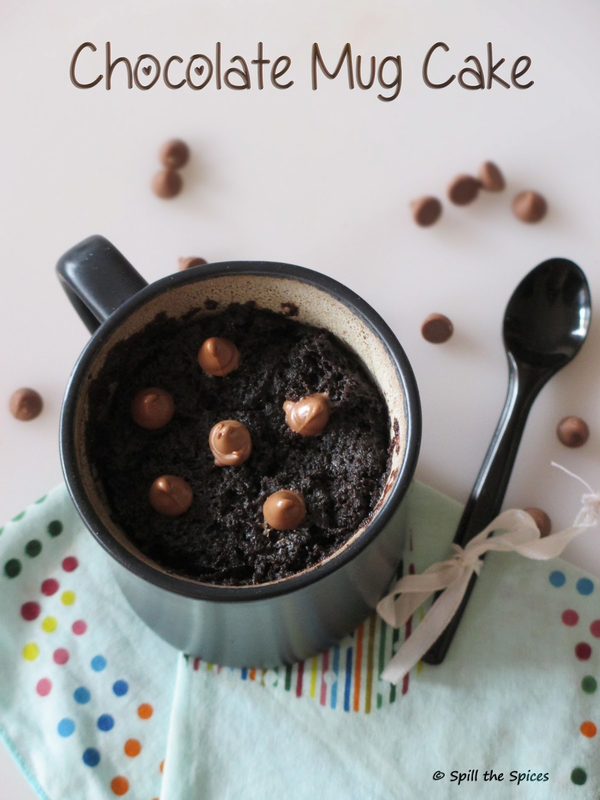 I set on a search for instant chocolate dessert recipes when I spotted this mug cake recipe in Sharmi's Passions. 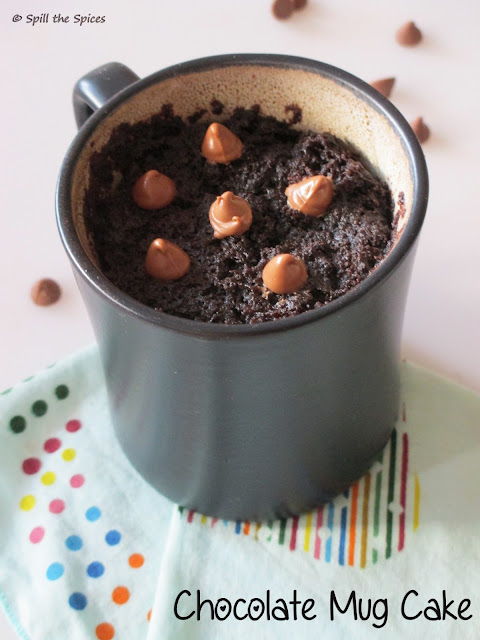 I decided its high time I give a try to this mug cake. Luckily, I had all ingredients and went ahead to make this instant cake. The cake turned out soft, moist and delicious. 1. In a microwave safe mug add maida, cocoa powder, chocolate chips, sugar, salt and baking soda. Mix well using a whisk. 2. Add oil, milk and vanilla essence. Combine everything well making sure there are no lumps. The batter should be smooth. 3. Microwave uncovered on high power for 2 minutes. Remove from microwave and allow to cool. Dig into the cake & enjoy! 1. Oven timings may vary. Mine is 800 W microwave and the timings worked perfect for the cake. 2. In original recipe, microwave the cake at 600 W for 1 minute and then switch to highest power and microwave one more minute. 3. Use any neutral flavored oil. I used mildly flavored olive oil. always like 2-min cake :) well made..
Looks yummy! Pass me a cup too. i m drooling.. this is so good..
Sona ,the 2nd pic with cake scooped looks really yummy.. Wonderful ! A hassle free cake in a jiffy! Looks nice and spongy too. Soft, moist and yummy cake! The pics are really tempting. super duper quick, yeah ! 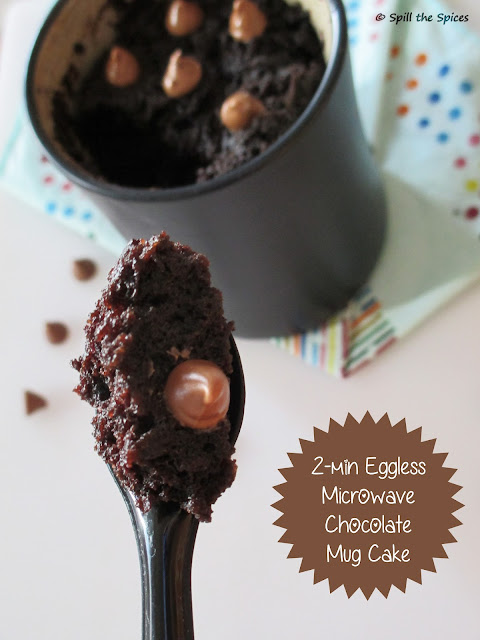 so hard to find good mug cake recipes, this is one of the best I've ever had! thanks for the great recipe!